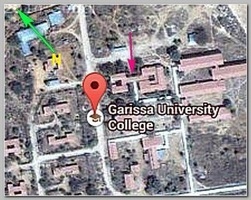 Masked gunmen have attacked, on Thursday 04/02/2015 dawn, a university in the town of Garissa in northern Kenya, police said, as ongoing gunfire could be heard from the university premises. Garissa area was already the scene of several terror attacks, mainly against Christians, carried out by Somalia’s al-Shabab. Witnesses said explosion and heavy gunfire rocked Garissa University College early on Thursday, and an ambulances were already at the scene. Local media reported that the gunmen have taken hostages inside the complex after raiding the university. According to later reports the gunmen shot indiscriminately in dormitories and killing at least 15 people and wounding 65 others, police said and took an unknown number of hostages. .Al-Shabab group said their gunmen were holding Christian hostages inside the complex in revenge for Nairobi’s troops fighting in Somalia.The gunmen divided students at the northeastern Garissa University between Muslims and non-Muslims, letting the Muslim students go, rebel spokesman Sheikh Ali Mohamud Rage told AFP news agency by telephone.More than 500 students were still unaccounted for, a governm ent minister said. 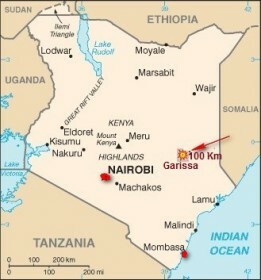 The attackers were eventually cornered in a dormitory by Kenyan security forces. Four of them died when their suicide vests detonated. A fifth gunman was reportedly arrested. More than 500 students managed to escape. Eventually at least 147 people have been killed after Kenyan troops cleared a university dormitory in the town of Garissa in northeast Kenya that had been seized by al-Shabab gunmen, officials and local reporters say. The Kenyan government has offered a reward of $53,000 (£36,000) for the man it says planned the killing – Mohamed Kuno, a former Kenyan schoolteacher, now thought to be in Somalia. ** One of the four gunmen who carried out the attack has been identified as the son of a government official, Abdirahim Abdullahi, the interior ministry has said on Sunday 04/05/2015..
Abdirahim Abdullahi’s father is a local chief in Mandera County in the north-east of the country. He had “reported to the authorities that his son had gone missing and suspected the boy had gone to Somalia”.ministry spokesman Mwenda Njoka said. Abdirahim Abdullahi studied law in Nairobi and was an “upcoming lawyer”, Mr Njoka added.
.** Kenyan police, on 06/04/2015, have charged five men in connection with the Garissa attack The five men pleaded not guilty to 152 counts of committing acts of terrorism in a Nairobi court on Thursday. The prosecution alleges that the five suspects colluded to carry out the attack, but have not said what their roles were. Prosecutor Daniel Karuri urged the court to deny the suspects bail.